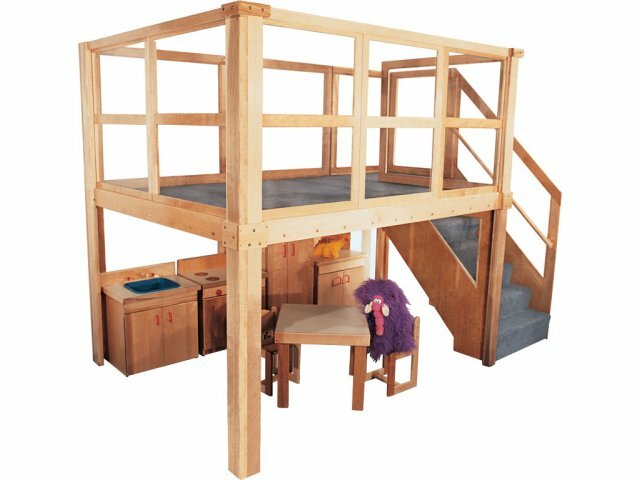 The Deluxe Preschool Navigator 2000 Play Loft provides a large raised platform that is safe and sturdy, a perfect space for imaginative play, group work, story-time and more. The combination of state-of-the-art materials and old world craftsmanship make this loft one of the very best investments that you will ever make for your program. 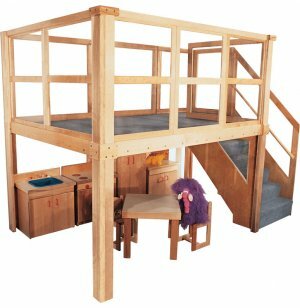 This loft is designed to be set up anywhere in the classroom. Clear, unbreakable, easy to clean polycarbonate panels surround the structure so caregivers and teachers can keep playing children in full view. This classroom loft will outlast similar products by decades. It is supported by rock solid maple legs, deck panels and framework with a birch plywood deck, steps and stair panels. Four coats of eco-friendly water-based finish ensure that these play lofts will maintain their attractive appearance for many years to come. Indestructible: Unbreakable polycarbonate panels surround the upper deck for easy supervision. Safe Design: Fully carpeted play lofts prevent children from slipping and falling. A lower rail on the steps helps maintain balance. Super Tough: Rock solid maple and birch plywood construction is reinforced by four coats of eco-friendly water-based finish.